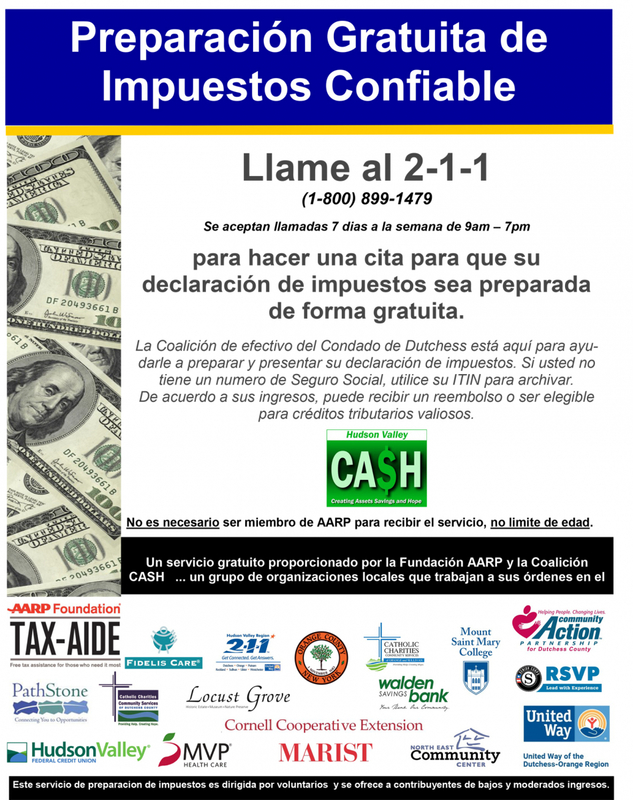 Hudson Valley CA$H Coalition and AARP Tax-Aide sponsor FREE TAX PREPARATION for low to moderate-income working families, individuals and seniors in Orange and Dutchess Counties. Call 2-1-1 NOW to make your appointment for FREE tax preparation. Tax sites open the first week in February. What is the Hudson Valley CASH Coalition? The Hudson Valley CA$H Coalition (Creating Assets, Savings and Hope) is dedicated to helping families and individuals in the Hudson Valley save money and improve their financial stability. The coalition provides free federal and state tax preparation for taxpayers living in New York counties of Dutchess and Orange. To ensure the quality of the service, tax preparers receive many hours of training and are certified by the U.S. Internal Revenue Service. In 2018, over 7,797 tax returns were prepared and filed in Orange and Dutchess counties. To get more information about the 40 tax preparation locations in Dutchess, Orange and Putnam counties, call 2-1-1 or 800-899-1479 (daily, 9AM to 7PM). Appointments start the first week in February, but reserve your space now. Tax preparation sites are open from early February through April 15, 2019. Federal and state tax returns for tax year 2018 will be prepared and filed electronically. Get more information (pdf) about free tax preparation service. Get ready for your meeting with a tax counselor. Download and print the readiness checklist (pdf) to make sure you have all the important documents for your appointment. More info here. Partner organizations of the Hudson Valley CA$H Coalition include United Way of the Dutchess-Orange Region, AARP Tax-Aide, Catholic Charities, the IRS, Cornell Cooperative Extension, Community Action Partnership of Dutchess County, Fidelis Care, Hudson Valley Federal Credit Union, Maplewood, Marist College, Mount Saint Mary College, MVP Healthcare, North East Community Center, Orange County Office for the Aging, Pathstone, Pawling Resource Center, RSVP Senior Volunteer Program United Health Care, United Way Hudson Valley Region 211 and Walden Savings Bank. These organizations work together to assure access to free, reliable tax preparation services, so individuals may claim the credits to which they are entitled (especially the Earned Income Tax Credit) and receive information regarding services that may help them stretch their small incomes. Remember, you can get your taxes prepared for FREE! 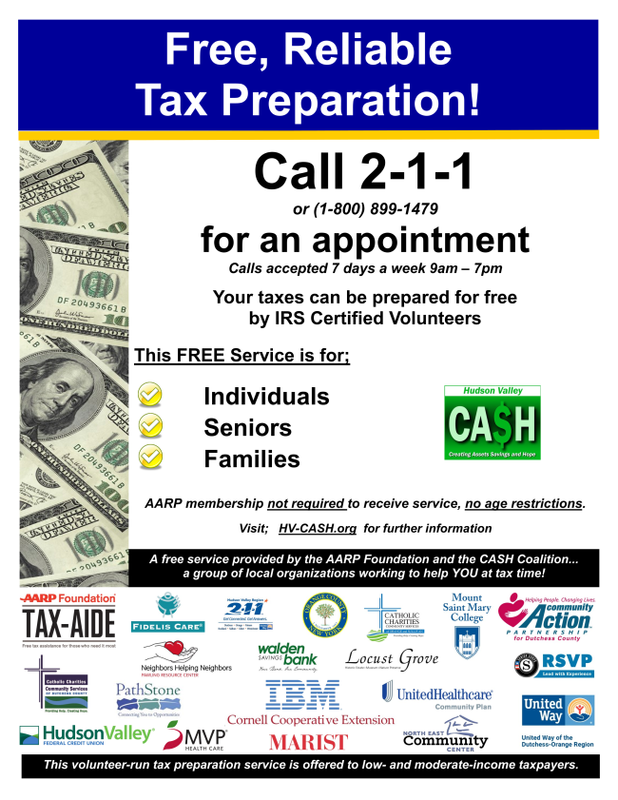 call 2-1-1 now to schedule YOUR tax-preparation appointment!